Brussels-based one man project PRAIRIE debuted in 2013 with a compelling and dark self-released EP called “I’m So In Love I Almost Forgot I Survived A Disaster”. A very promising record, if a little raw on the edges, oddly labelled here and there as post-post rock, whatever that means. Or is it because the influences are clearly rooted into the most experimental and abstract side of post-rock, while expending its sound pallet to incorporate ambient, noise, drones, electronic, spoken words, film music and even post-punk aesthetics? Oh, but that's quite what post-rock is, isn't it? And does it matter? Nope. What matters is that the man behind PRAIRIE, Marc (Notthefckngdesigner) Jacobs, has signed a deal with Berlin-based Shitkatapult label, which has released a couple of months ago PRAIRIE's second effort to date, "Like a Pack of Hounds", and that's good news. It is good news because the man's music deserves to reach a wider audience. All the elements which made the first EP a fine listen are there, but like developed and extended towards larger than life yet terrifying proportion. I knew the man has an extremely vast musical knowledge as a music lover and professional, but it's fascinating to hear how those numerous influences ended up into this impressive musical sum that's greater than its parts, and best of all deeply personal, while almost worryingly relentless. Some parts could almost be too obvious to pinpoint, experimental composers Tim Hecker and Ben Frost come to mind, and when exceptionally - the album being mostly instrumental - one track got closer to a song, with vocals indeed, like on "Closed For Thirty Midnights", it's hard not to think of Phil Elverum's Mount Eerie/ The Microphones. 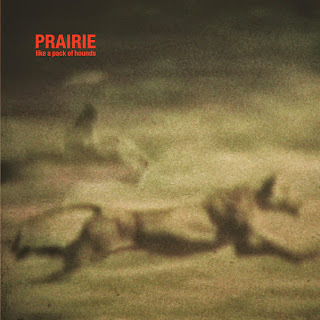 The thing is, PRAIRIE does it better, surely concerning them surprisingly hip and overrated above mentioned couple of composers, because contrary to Tim Hecker's sterile harsh metallic multi-layers-that-go-nowhere and surely Ben Frost's special fx boom blasts-that-well-blast-for-nothing-and-is-that-all-there-is, PRAIRIE's "Like a Pack of Hounds" contains full formed fertile compositions, with an effective sense of direction, while somewhat keeping it close to Earth. There is sweat and dirt and sorrow and despair and even menace around here. An ambitious, uncompromising and ultimately rewarding listen. Stream it down here, share it and buy it on the Shitkatapult website.